Sprawl is haphazard, auto-oriented development that spreads outside of existing downtown centers while attending devastating impacts on our environment. Increases traffic. Did you know? nationwide, air pollution from cars annually results in 120,000 premature deaths and $40-50 billion in health care costs. 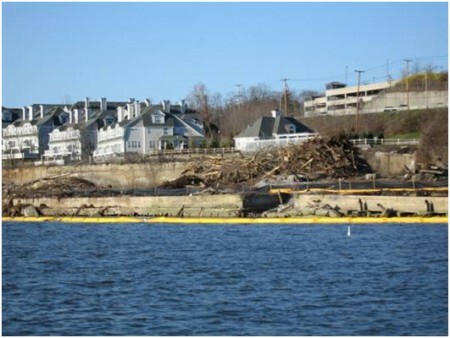 Launched in 2005, Riverkeeper’s Smart Growth Campaign began with an investigation of the many negative impacts of unchecked development in the East-of-Hudson Watershed. Sprawling development is destroying our watershed communities and polluting our critical drinking water supplies. Sprawl’s greatest threat to water quality is the attendant increase in impervious surfaces, primarily pavement. To protect water quality and watershed communities, Riverkeeper actively participates in the environmental review process when developments are proposed in the watershed. We work hard to stop the most egregious project from being built and ensure that the environmental impacts of those are built are minimized by advocating for reduced project size and use of progressive building technologies and practices. Riverkeeper's Two Part Report on SprawlPave It…Or Save It? Riverkeeper released Save It! Volume 2, as a follow-up to our first report, Pave It. . . Or Save It? Volume 1: The Environmental, Economic, and Social Impacts of Sprawl, which has proven to be an invaluable asset to local governments and concerned citizens in exploring the root causes and impacts of sprawl. In Volume 2, we identify viable solutions for local governments and citizens that address and help minimize the impacts of sprawl. Water quality in heavily developed areas degrades with each new development project. By replacing natural soils with paved surfaces, the landscape loses its ability to purify stormwater naturally. Rain collects on impervious surfaces, scours pollutants off roads, gathers velocity, and runs off into the nearest surface waters, which are part of our unfiltered drinking water supply. A particular health concern for humans is air pollution. By spreading apart the elements of a community and relying on automobiles for transportation, sprawl leads to increased vehicle emissions. Air pollutants, such as the carcinogens emitted by vehicles, have toxic effects on human organ systems and physiological processes and are linked to numerous ailments, including asthma, allergies, and osteoporosis. Nationwide, air pollution from cars annually results in 120,000 premature deaths and $40-50 billion in health care costs. As sprawl degrades the environment, it also impairs the local economy. New infrastructure in sprawling areas, including new roads, water lines, and sewer lines, along with expenditures for new schools and increased police and fire protection cost taxpayers millions of dollars. While commercial and industrial development may sometimes generate more tax revenue than they demand in services, other factors often diminish such gains: they reduce local property values because employees prefer to build new homes in neighboring towns rather than next to the commercial or industrial facilities where they work, and larger companies can often convince a community to widen roads, offer tax breaks, or provide free water and sewage lines. An investigation in New Paltz, New York found that the widening of streets, at a cost of $2 million per mile, would cost taxpayers $5.1 million dollars. The cost of providing services to new homes located outside of existing infrastructure nearly always costs more than those homes generate in property tax revenues. Services frequently cost 125-150 percent of the tax revenue. Planning that keeps development in community centers leads to more efficient distribution of services, and therefore lower property taxes. Wetlands are considered the most biologically diverse ecosystem on the planet. They serve many important functions including habitat, flood mitigator and natural water purifying system. Sprawl is a significant factor contributing to the rapid loss of critical wetland areas. Wetlands often are ditched and drained in order to accommodate new building, agricultural uses, or to provide mosquito control. Native wetland vegetation can be replaced by nonnative, invasive plant species that are aesthetically pleasing to people, but do not provide equivalent wetland functions for water quality and wildlife habitat. Because many wetland maps are old and outdated, and different maps employ different definitions of “wetlands,” it is very hard to document the exact wetland losses that are occurring in New York. Estimates of wetland losses vary greatly, even according official government agency data. As recently as 1999, the U.S. General Accounting Office estimated that approximately 290,000 acres of wetlands are lost nationally per year. Few wetlands remain in the NYC Watershed. According to a 1999 report by Watershed Inspector General Jim Tierney, in the 571 square mile Catskill Watershed, there are 3,872 acres of wetlands (which comprise about 1.06 percent of the watershed’s land surface area). In the 1,013 square mile Delaware Watershed, there are 5,242 acres of wetlands (or about .81 percent of the watershed area). In the 387-square mile East-of-Hudson Watershed, there are 15,809 acres of wetlands (or about 6.4 percent of the watershed area). These figures are somewhat out of date, and undoubtedly wetland losses have continued in the subsequent years. It is critical that the few remaining wetland resources be protected and preserved. Steep slope disturbance can result in grave consequences to watercourses. Erosion and sediment from construction sites can impair water supplies, the biological integrity of a waterbody, and the local hydrology. Erosion and sediment impair water supplies by: increasing nutrient loading, impairing the ability of chlorine to disinfect the water supply, reducing the storage capacity of reservoirs, and increasing the treatment costs of any municipalities that filter their water supply. Erosion and sediment impair the biological integrity of waterbodies by filling streambeds and threatening macroinvertebrate habitat. Additionally, erosion and sediment alter hydrology by reducing the stream’s carrying capacity and increasing the likelihood of flooding. For these reasons, construction activities on steep slopes should be severely limited. EPA recommends periodic inspection of all graded areas and supporting erosion and sediment control practices, especially after rain events. Early detection and repair of failing control measures are critical in preventing small-scale eroded areas from becoming significant conveyances of stormwater runoff and its attendant pollutants. In December 2007, New York State announced the formation of a New York State Smart Growth Cabinet, a group of state officials that will work with local municipalities to encourage and advise on best practices to handle increasing growth and development while protecting New York’s environment. The Cabinet will review state agency spending and policies to determine how best to discourage sprawl and promote smart land use practices.